Gareth Long - Education: Venue for good designs?? Where's the best place to meet a group of education interior designers and FF&E experts.... no real problems here - a bar seems the obvious place. This informal relaxed picture, at "Breezes in the Bay" in Grand Cayman is deceptive and actually shows formidable talent and ability. I am so lucky to be in a situation where I can work with, and learn from, some of the best in the world in what they do. I would hate to suggest that the bar is where they have lots of their best ideas but we were swopping a range of ideas and designs. Crucially they are all such nice people as well as being so incredibly professional at what they do. The real benefit for us is that they all have different experiences and contacts so they are also feeding off each other as well as trying to provide us with the best possible ideas. This is a dynamite team who, quite correctly are challenging us in every area of our ideas. There is a massive difference from many local retailers who just want the deal and will sell us whatever we can afford - even if it is not the most appropriate educationally. No local retailer has ever asked how we want to use FF&E. These guys want to know what we want in relations to how it supports the delivery of the curriculum - an obvious and challenging way of working which is how it should be - this is really helping the country. 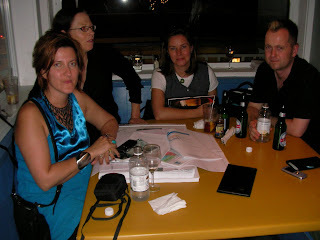 From l to r: Kate Stewart: Team A go go from the UK, Kris Fielding, He3ad of Creative Design from Felding Nair International, based in Tampa, Wendy... Head of Interior Design, OwPP in Chicago and Steve Stewart, Designer, again from Team a go go. Too much work - not enough play! Yes - we really do want your views..
Ofsted Meeting - so who makes a decision? Education Law reform - working with the experts.